Did you know that you can use Google Forms to set up complex agent call scripts to help guide your team through a series of questions while on a live call? For example, if an agents wants to help qualify calls for sales, they can create a series of guided questions in a Google Form for an agent to answer while on a call. The data from that form can be sent directly into Google Sheets, for quick analysis and reporting. 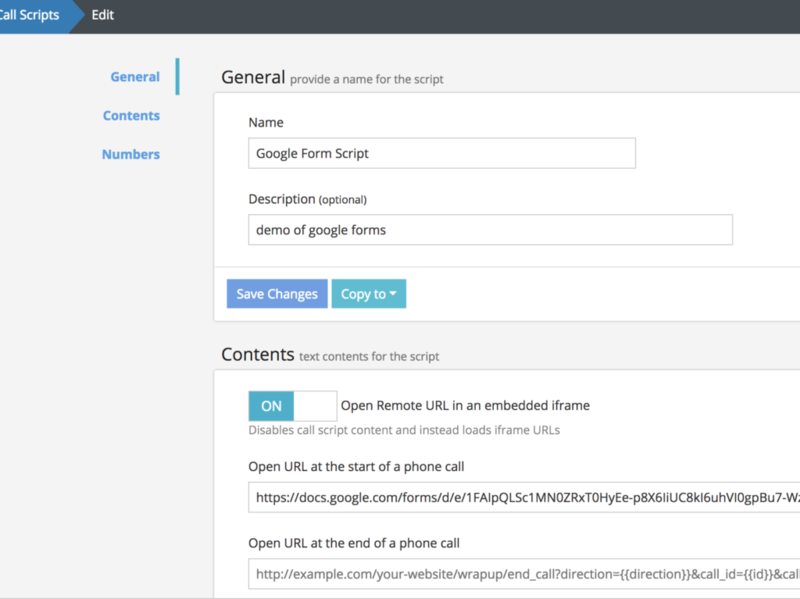 Once you have a Google Form created, setting it up as a call script in CallTrackingMetrics takes only a few clicks. To get started, navigate to Numbers → Call Scripts. Next, copy the iframe embed URL from Google Sheets. Finally, in your new call script, toggle the iframe option ON and paste the embed URL into the “Open URL at the start of a phone call” input field. Be sure to only copy the src attribute from the iframe. As agents take calls, they’ll have the form embedded in the Softphone, so that they can easily complete it during a live call. As they submit their responses, just like any Google form, the data will be collected into Google Sheets. This is a powerful feature for both contact centers and sales managers who are training new agents!